A few years ago, I wanted to go see Pharmakon when she was here in Pittsburgh. I didn't really know anything about her musick, but there was a lot of hype about the show. Based on what I had heard and read about online, I was sure that I would like it though. As I do sometimes, I didn't listen to anything because I wanted it to be a surprise. When the time for the show actually came, I didn't go, but I know a lot of people that did. It seems like some guys got really handsy and creepy at the show with Pharmakon, seemingly using her audience baiting as an excuse. It was upsetting to hear that, and I wondered what I would do if that happened at an event I was at. 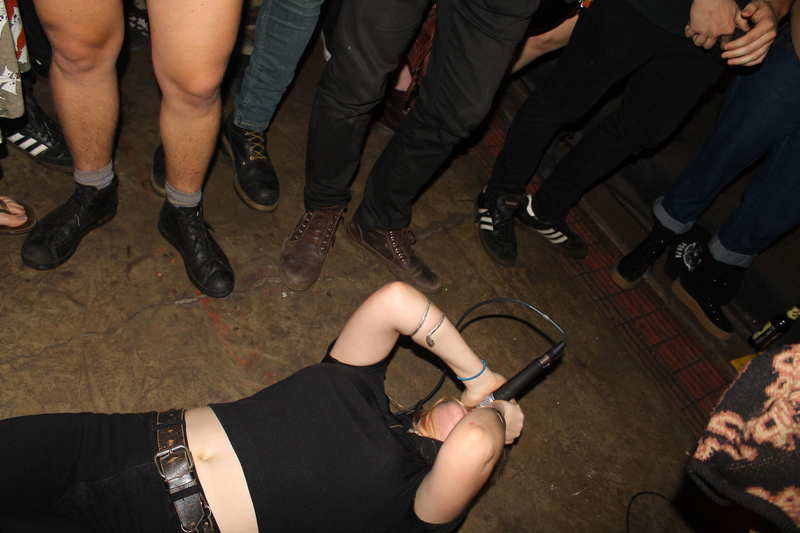 When Pharmakon played at the Shop on May 23rd of this year, I found out. Let's start at the beginning. The show started a bit late. It was sold out, and a few people got tickets at the door. I think I have seen the Shop more packed in the past, though the audience grew throughout this show. First up was my friend Margaret Cox. Her set was really cool, though there were a few technical issues. I don't think it really detracted from anything. 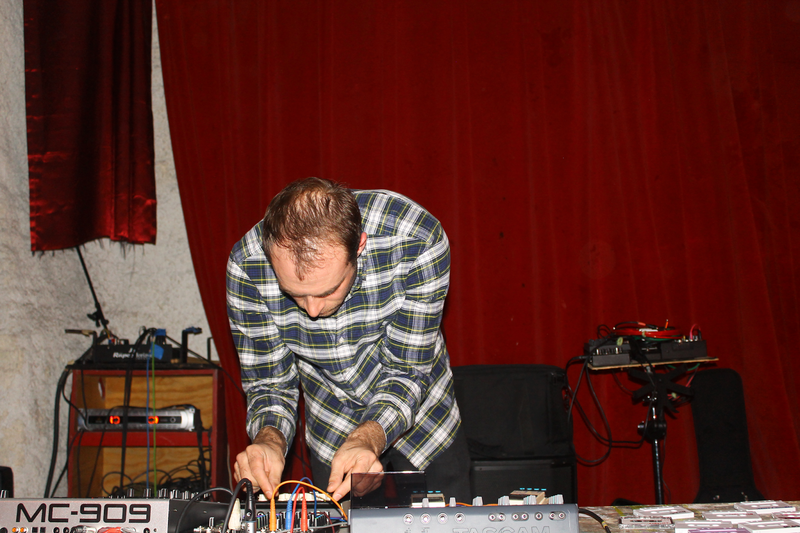 Experimental musick is experimental; sometimes things don't work. 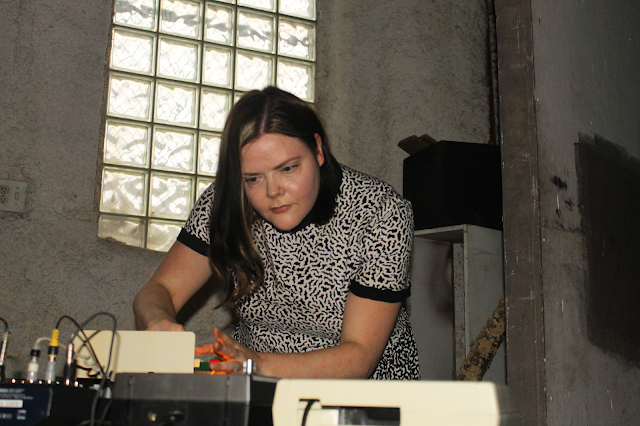 I don't know exactly what the device she always uses is (some kind of magnetic tape reader), but it is always interesting. This set was sparse at times, and it fit the mood of the room. There were awesome textures and cluttery sounds. It was a little eerie. At this point, I saw a person that bothers me a lot. I won't explicitly name this person, but he has caused a lot of problems for people I know and was a jerk to me when I used to hang out with him. He has sexually assaulted and harassed friends of mine. Some people didn't want to be there because he was there and felt scared. I got so mad and confronted him about the things he had done: the sexual assaults, the manipulation, bullying, sending fucked up messages to people online, just general abuse and creepy behavior that he has never apologized or made himself accountable for. He said he didn't do those things, but he did. It amazes me that someone can still try to deny things they have been doing for years, but, of course, nobody wants to be the bad guy; nobody thinks they can do these awful things to others. Back to musick! I thought the second person to play was Container, but it was actually a guy named Twig Harper. He was in Nautical Almanac, who I saw in the same room years prior. I don't think he was actually listed on this bill. Despite that, Harper's set was amazing! He played some sputtering, spastic sounds. It wasn't pretentious or pointlessly loud with no substance as noise can be at times. This was actual artistry. Is that unfair to say? Harper seemed nervous, and it made him endearing to me. Container, from Providence, Rhode Island, was actually up now. He took some time to set up, so I went outside for a second. It was obvious when he started to play. Here were the obnoxiously loud aspects of noise. Everybody was really excited to see Container play, but I didn't like his set at all. It was loud dance music with some breaks and feedback swirls and stuff. I don't really like that kind of thing. The crowd really filled in at this point though. 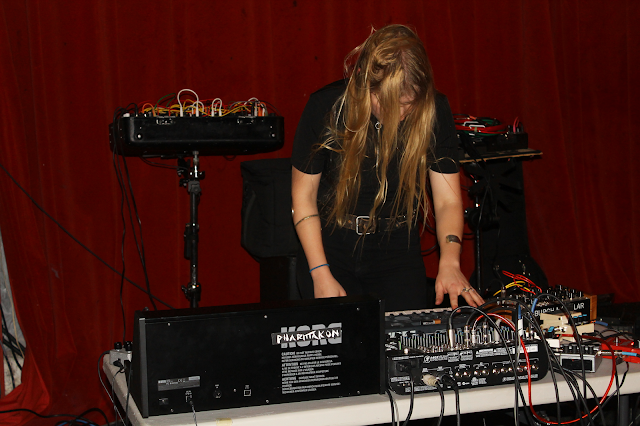 Pharmakon was finally up, and I was really excited. As I expected, she played loud, with actual force and teeth. She walked through the audience like Moses parting the Red Sea. She brushed up against people and acted aggressively. Naturally, this brought some old-fashioned creepiness to the forefront; some guy, who I had just met outside, different from the previous guy above, started to rub her head and brush up against her. Thinking quickly, I pushed the guy and told him to cut it out. Beer spilled all over everyone, like the aftermath of Mifune's sword. The guy seemed confused. Pharmakon pushed up against him and returned the favor. She patted his head; she screamed in his face. It was awesome. I was still pretty upset, based on all that had happened earlier, and I pointed at the guy. I yelled at him. Since she already had it under control and probably didn't want any actual bloodshed, Pharmakon pushed me out of the way and sat me down on a bench. I just thought, "well, yeah, I understand". When I tried to get back up, two people wouldn't let me. They yelled at me and told me that I was causing a problem. I pushed them out of the way. I guess I was causing a problem. I don't think what I did was necessarily helpful. From how I see it, her giving it back to that dude is the whole point. It's a whole thing about baiting the audience to punish them when they act out of line. I felt kind of stupid. I don't know if vigilantism is a paragon to uphold, it certainly didn't make me feel good, and I am not sure that I actually helped anything. I don't know if it was wrong or right, or how to really define those concepts. So after Pharmakon's set, I took a walk. I talked to a friend on the pfone. When I was walking, I saw that guy crying on the sidewalk. I felt bad for him but you also shouldn't touch people without their permission. After my pfone call, we had a long talk about apologizing, acting responsibly even under the influence, and how I thought that he wasn't a terrible person even if I thought what he did was wrong. Everybody lived happily ever after I guess? The End. 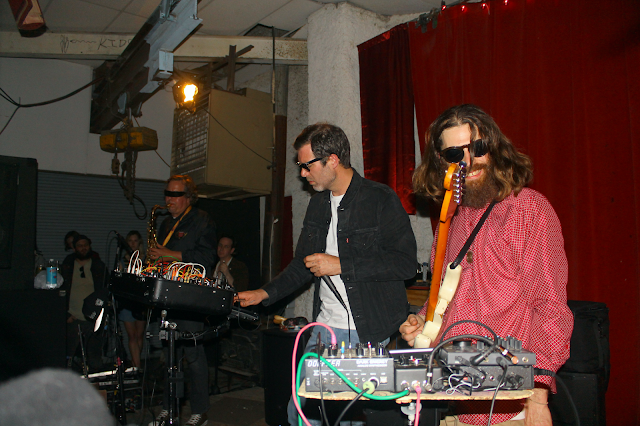 Actually, there was one more band, Wolf Eyes. I have enjoyed the Wolf Eyes side projects I have seen, but when I saw Wolf Eyes at Spirit in 2015 I was bored. I missed some of the set when I was talking with that guy. What I did see of their set, I enjoyed. It was dense and sludgey and droney. It was not boring though. John Olson's horns added a lot to the set, as I feel like they do in every project he is in. They have such a cool timbre and texture, a manifestation of the Detroit wasteland. 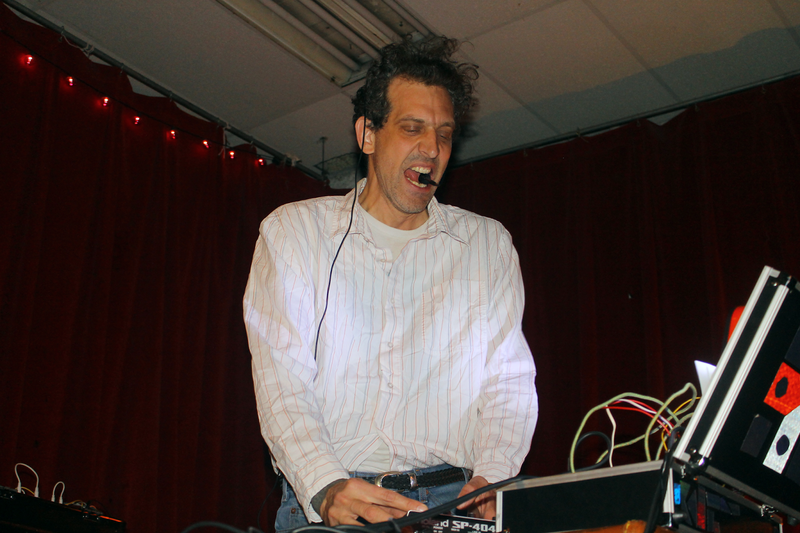 Wolf Eyes' "too-cool-for-you-to-the-point-of-parody" was somewhat subdued here. That's the thing that really bugs me about them, and it's an example of what I meant above in that little diatribe about a lack of substance. Noise bros are scum. My former friend above is one of them. This whole post is a bunch of weird rants and awful stories, so it's okay if you missed it. I'm glad I went to this show, even though it was so crazy. It reminded me of those good times before I knew that my former friend was so awful. I'll be talking more about those rose-colored, naïve lands of the past soon. This is a new world, tempered by fire and steel, with the same roaring blood that fed the weird soundscapes of the Roup days. Since that time, I didn't go to a lot of shows, because I was so busy with work and school; everything seemed different too. I think things are different in a good way, but there are a lot of cool sounds to see if you are courageous enough to seek them out.